Our purpose with a Yoga and Hiking Retreat works well on this magnificent island, Kauai. Did you know each of our Retreats are carefully crafted from beginning to end? First of course, is to choose the destination. We search for unique cultures and incredible, natural beauty. 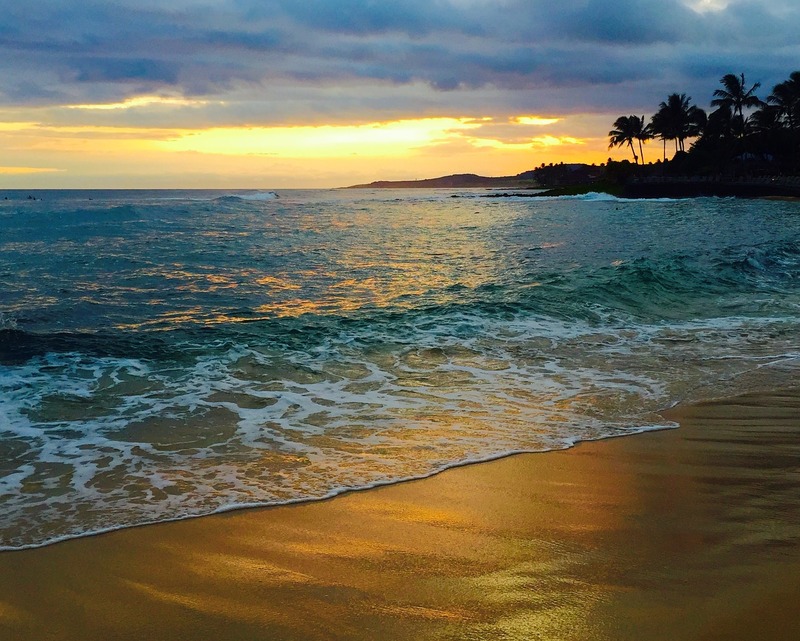 Kauai, Hawaii is perfect for our next adventure! The lush, vibrant environment will inspire you to explore your own wild side, the waterfall hikes will challenge you physically and the calming, warm waters will allow you to relax, push away the external noise and listen to your inner voice. The island’s laid-back atmosphere and rich culture found in its small towns immersed in the canvas of nature make it truly timeless. This island is a feast for the senses. The island Kauai is more than just dramatic beauty, it is also home to a variety of outdoor activities, it certainly is a true adventurer’s playground. On this special retreat you will experience outdoor yogain the most magical settings you can imagine, which is not even comparable to indoor yoga studios. We will also lead you on some incredible hiking trails selected by our experienced local guide Andrew. Read more about Andrew below! And since we are on an island with many amazing beaches, we will give you the opportunity to try surfing, paddle boarding or snorkling and enjoy a fun beach day together. The spectacular natural wonders, Waimea Canyon including the Napali coast, are some of the areas you will have the opportunity to explore. We have included lunch boxes on the days we are hiking, and will enjoy it outdoors. We will also explore local food by suggestions of our local guide Andrew, who knows the restaurants in the area very well. Friday night is a time when the locals go to the famous Hanapepe night market to enjoy some native food, and so will we! Apart from enjoying the outdoors life on the island, you will also receive a special gift from us. 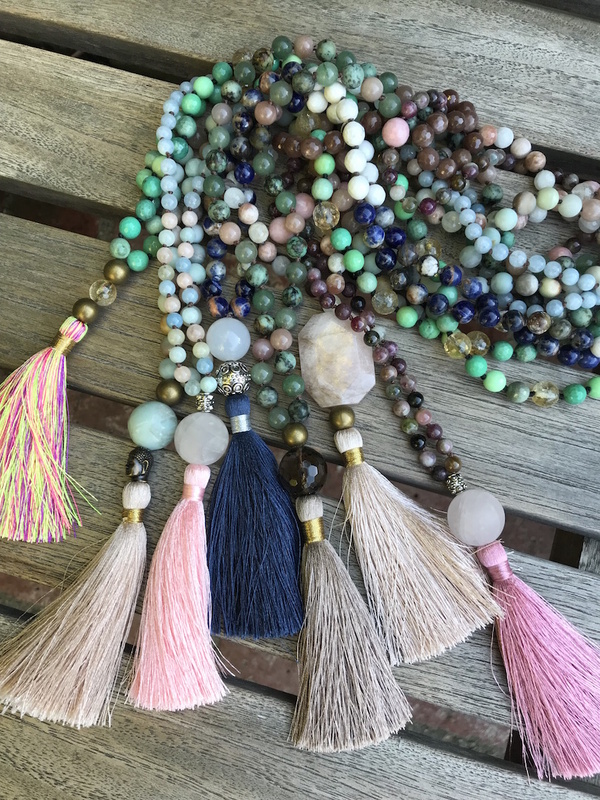 You will be presented with an individually handcrafted, one-of-a-kind piece of yoga jewelry, made by the Swedish jewelry designer Lotta, the owner of forUjewelry in Los Angeles. Lotta is also the partner of Maria and she will, among other things, be responsible for handling the participants registrations and happily help out with all the questions you might have. 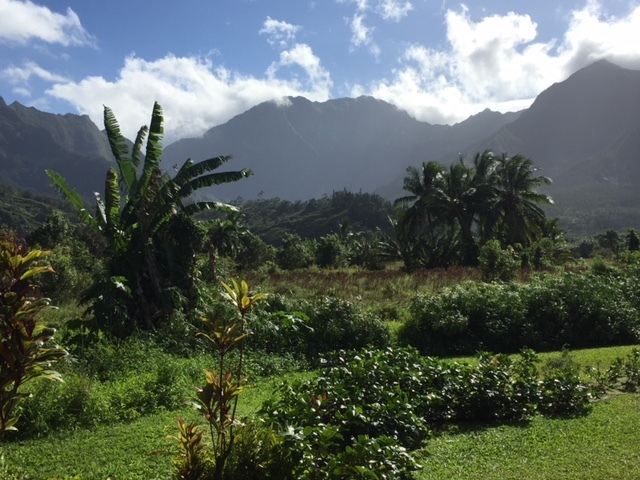 This yoga and Adventure retreat in Kauai is designed to fill your heart with nature, your soul with daily awakening and your body with nourishment and deep rest. Some of the days we will start with a morning flow class and an afternoon restorative yin class. During the day we’ll have adventures and hikes planned and sometimes the early yoga session at the resort will be replaced with an outdoor yoga class in the wilderness. It will also be some time when we heartedly invite you to do whatever you want. Whether it be walking the beach, taking a nap at the resort or finding another adventure to embark on, your time is yours to make the most of. Together with her team, Lotta and Andrew, she has designed this special designed Kauai Retreat. 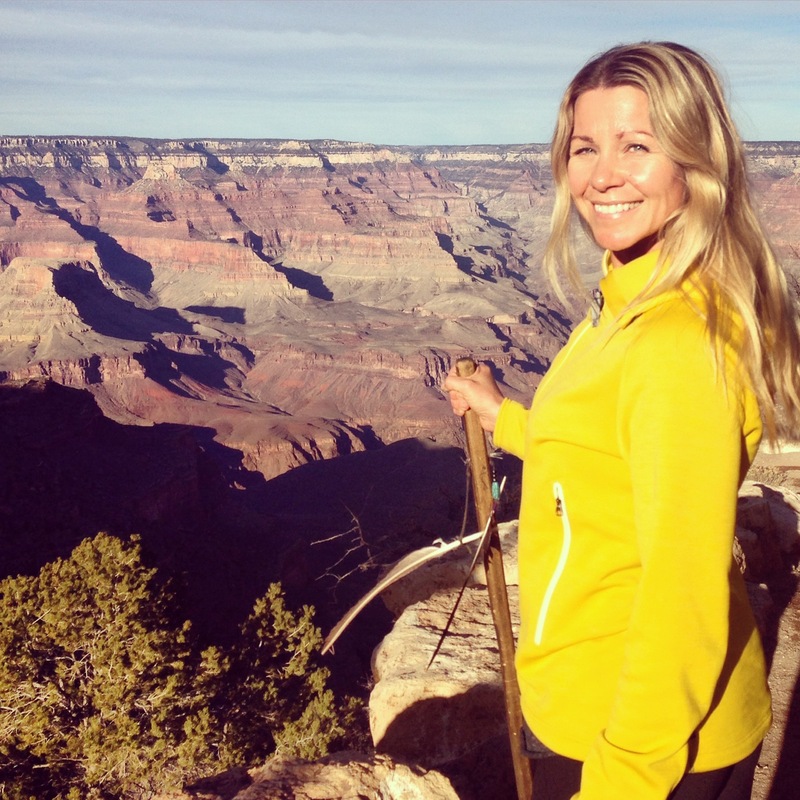 Kelly Collins is a yoga teacher, a mind-body wellness coach, and a Reiki practitioner based out of San Diego. 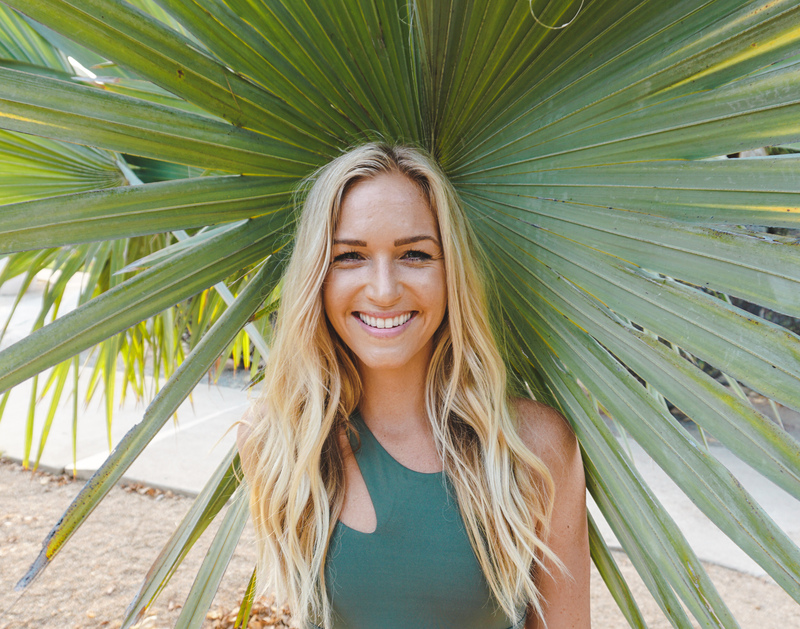 Kelly has been in the fitness space since 2009 and in 2014 she decided to go to Bali to do her YTT in order to learn more about yoga and meditation. This experience turned out to be so much more, and Kelly was hooked. She suddenly had a newfound awareness and perspective of her body, and was able to heal emotional traumas that she had been bottling up for years. It was truly eye-opening and forever changed the way that Kelly looked at physical movement. Since then, Kelly have been teaching yoga, personal training, and practicing Reiki in San Diego, as well as leading yoga retreats around the world. Kellys teaching style stems from the variety of physical movement practices in her background and can be described as creative, athletic, and intuitive. She focuses strongly on breath, alignment, and reconnecting the body and mind. Kellys ultimate goal for this retreat is to provide a space for you to reflect, heal, discover your highest self, and to find a sense of mind-body balance that you can take home with you! Andrew Hewitt is our local adventure and hiking guide. He has lived in many places like, Saudi Arabia, Arizona, New Zealand, Canada, until he decided to move to Kauai, 7 years ago. He started his own Adventure company based on his experiences and love for the outdoors and how it affects you. He believes in the healing powers of nature and its connection to our minds and bodies. Andrew has a degree in Anthropology at University of British Columbia and has a deep respect for indigenous cultures. 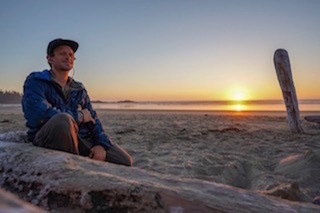 We are happy to work with Andrew on this unique Yoga and Hiking retreat in Kauai, and what makes it even more special is that Andrew is a yoga teacher and a student for the past 15 years. Andrew is also educated in first aid and cpr certifications. For our first day hike we will explore the beautiful lush mountainous eastern side of Kauai. We will summit a mountain peak with exceptional views and then go to a few waterfalls for some swimming, jumping off rocks and rope swinging. If time allows, we’ll also go to another mountain peak with incredible views looking towards Mt. Waialeale, the wettest place on the planet earth. Today will be a perfect mix of fun and challenge, the perfect way to start our island adventures together. The Hanapepe night market is a fun, local scene. Native foods, shops and art galleries make up this quaint market where we will spend a few hours as the locals do every Friday night. Hike the famous Napali Coast Trail, one of the most famous hikes in the world. We have the opportunity to see a truly amazing waterfall, Hanakapiai. Although a challenging hike it is well worth it and the payoffs are outstanding. It is 2 miles to the beach and then 2 more miles upriver to the waterfalls. It’s an 8 mile (13 km) return trip with a good amount of elevation changes and slippery conditions, by far the most used trail on Kauai and you will see why. We will also enjoy a magical yoga session on the beach. Today we will leave early to enjoy a long and magic day in the wilderness of Kauai including lunch and an outdoor yoga session. 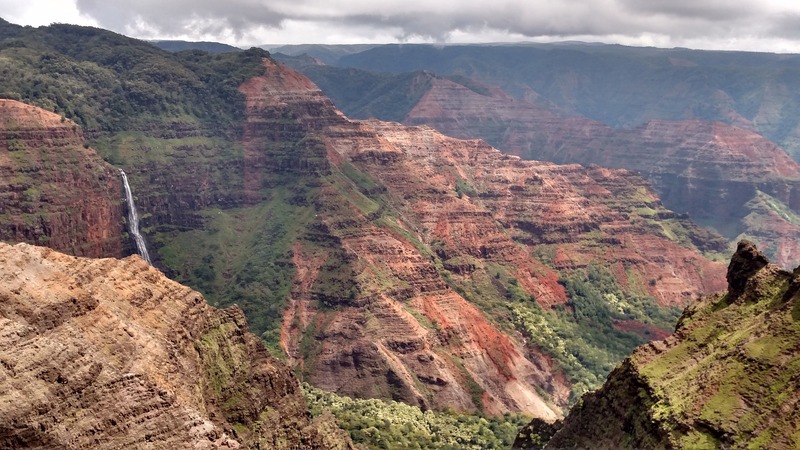 Hike the incredible Napali coast from 3500-4000Ft (approx 1000 meter above the cliffs). Today will be a longer challenging day but the reward is unforgettable views and feelings from the places we get to see. We will be doing two of the best Napali Ridge hikes, connected by a 2 mile long trail making today about 10.5 miles (17 km), with elevation changes that are challenging but not overwhelming. The height helps with temperature and humidity and makes the hike pleasant. We will see some wildlife, native birds, potentially whales from the lookouts and some of the most outstanding views on the island. We will also have the opportunity to practice yoga on the connector trail at a beautiful, fairly secluded lunch spot, which means we will have this to ourselves for the most part. Waimea Canyon viewpoint and hike Alakai trail including an outdoor yoga. One of the most beautiful remote canyons in the world. It has world class hiking trails and vast amounts of exploration. Today we will focus on some of the best trails, in canyon rim, that show the diversity and extreme complexity of the canyons. You will get the opportunity to swim in one of the falls, above the canyon rim, and hike along some remote areas, giving insight into the history of the island’s culture and geography. You will learn about how the canyon was formed and be able to physically explore both sides of the canyon, which were formed over 1 million years apart. It is a place and day that will leave you in awe and wanting to come back to Kauai for more. The canyon has so much to explore. One day will only be a beautiful glimpse of what it has to offer. We will also do our outdoor yoga session in the canyon. On the sunny Western Shore of Kauai, welcomes you to a unique Hawaii retreat experience. Historic, restored plantation cottages by the oceanfront in a tropically landscaped location, that stretches along a magnificent black-sand beach. The cottages feature comfortable Hawaii-style furniture, a fully equipped kitchen and private lanai. Each cottage has its own history and charm; no two cottages are alike. Each cottage will be shared by 3 participants and you will have your own bedroom, but share bathrooms. Amenities include a two-mile long stretch of walking beach, an oceanfront pool, on-property laundry facilities, WiFi, gift store/activity desk, juice and ice water and morning coffee in the lobby. Nestled in the idyllic town of Waimea, nearby the entrance to Waimea Canyon, our tropical oasis offers you a Kauai from a gentler, slower-paced time. The quiet seclusion, tranquil surroundings, and serene landscape gives you a place to recharge your body and rejuvenate your spirit. All prices are per person in USD. All bookings include a deposit that is 30% of the total trip cost. Final payments are due 60 days before the start date of the trip to keep your spot secure. The price is based on 3 participants sharing a cottage.